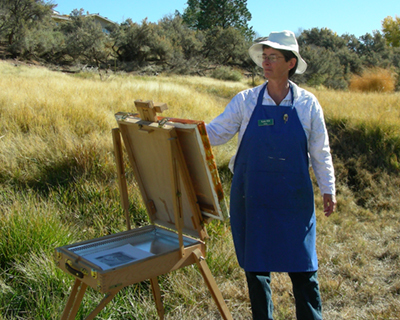 I am a local artist who specializes in Colorado and Alaska landscape, animals and flowers. I display my paintings locally and participate in groups whose goals are promoting the arts. Local artist, Katie Hill, specializes in painting local landscapes. Growing up in Alaska she was influenced by her surroundings and inspired by landscape paintings of both of her grandmothers. She uses personal photographs as references and delights in merging multiple images to create unique paintings. She is active in the art community, displaying her paintings locally and participating in groups whose goals are promoting the arts. Her art is now on display at the Blue Pig gallery in Palisade.